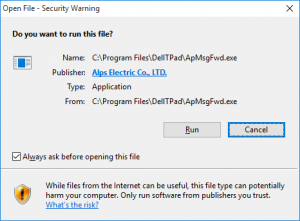 During a deployment of Windows or even after Windows is deployed you see an Open File – Security Warning prompt when a .EXE runs (similar to the one on the right). This happens because when you download an .EXE, .ZIP, or .CAB Internet Explorer (as well as Firefox and Chrome) saves what is called a Zone Identifier, telling the Operating System the file came from the internet and not a trusted zone. In certain deployments this can happen several times when a user logs in to load all of the applications into the system tray, some of them being igfxtray.exe, apmsgfwd.exe, apntex.exe, apoint.exe, gfxui.exe, hidfind.exe, hkcmd.exe, igfxpers.exe. streams.exe -s -d "E:\MDTDeploymentShare\Out-Of-Box Drivers"
Make sure you run that in an Administrative command prompt and accept the license agreement on the first run. Hope that helps.